Microsoft Visual C++ is a integrated development environment (IDE) used to create Windows applications in the C, C++, and C++/CLI programming languages. It was originally a standalone product, but is now included as part of Microsoft Visual Studio. It offers developers a single application in which they can write, edit, test, and debug their code. The programming environment includes access to a lot of shared code libraries, which let developers use already-developed code for specific procedures instead of having to write their own from scratch. That shared code takes the form of dynamic link libraries (DLLs), a term most Windows users have come across at some point or other. When it comes time to deploy their software to users, developers have a choice to make. They can bundle those DLLs into the installation of their application, or they can rely on a standard distributable package of shared code. Most choose the latter, and that package is known as a Visual C++ Redistributable. There are several advantages to using a redistributable. The packages are made available by Microsoft, who also tests and updates them with bug and security fixes. 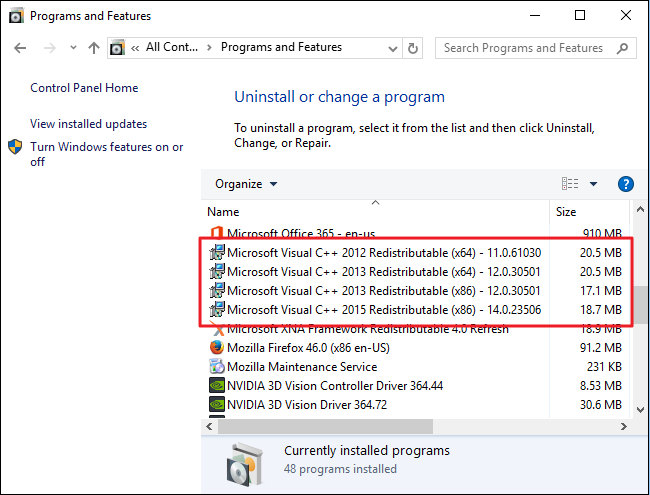 Redistributables also offer a single installation on a user’s computer that multiple programs can use at the same time. Why Are So Many Installed on MY PC? I installed a fresh version of Windows 10 on a new PC a little less than two months ago. As you can see in the picture above, I’ve already got four versions of the Visual C++ Redistributable on my system. On other systems, I’ve seen as many as twenty. So, how do they all they get there?